Having your dental front office team joining the Dental Phone Excellence Gold Members Achievers Group ensures that your team members move forward with all of their skills and systems. Private members meeting by invitation only. If you’re interested in learning more about the Dental Phone Excellence Gold Membership, Jayne would love to hear from you. 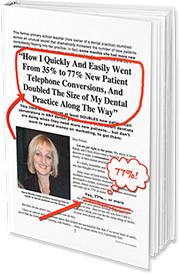 Contact Jayne today to get started—she can’t wait to speak with you and help you to transform your practice.